During thousands of years the Iberian shepherd has moved his cattle to the refreshing pasture land in the mountains up north, in order to escape from the draft and the heat during the summer months in the southern parts of the country. When the autumn rain started he returned to his valley down south. 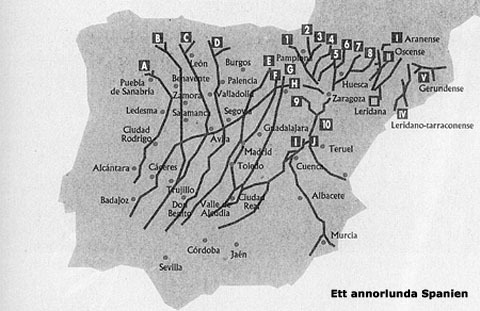 In this way an extensive network of cattle passageways (cañadas) developed which tied the northern and southern parts of the country together. Today it is partly preserved as an inalienable heritage. The network of trails, which stretches more then 6200 miles and occupies 1% of the surface of Spain, was proclamed in the 11th century by a royal proclamation, "La Trashumancia", the annual movement of cattle. Along these ancient trails there are remains of Iberian settlements, water-holes and wells, churches, villages and towns, which streets were formed from the original cattle trails. 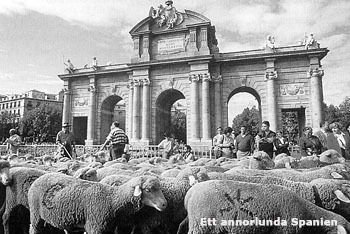 Between the 11th century and the 17th century flocks of 5 millions of sheep, most of them the merino-sheep, were transferred on the "cañadas" every spring and autumn, and in this way relations were created between north and south and they had great economic, cultural and social importance. The ecological aspect of La Trashumancia is also important, since it has involved optimal usage of nature resources with minimal consumption of energy. The sheep goes "on their own steam" grazing on "las cañadas", which are not small trails but have a width of 250 feet. La Trashumancia exists in many countries, but on the Iberian peninsula it has had a significant importance due to Spain's special climate and orography; a long dry period from May to October and two large central tablelands which divides the mountainous parts in the north - green during the summer but covered in snow during the winter - from the valleys in the south - parched during the summer but very fertile during the winter. La Trasumancia prevented that large areas were cultivated and that very sensitive territories eroded. The cattle fertilized the ground, kept the landscape open and contributed to better control of forest fires. The pasture land gave in addition a great variety of plants, today one of the largest in the world, with more then 40 different species per square meter. From all this species many animals, such as hares and rabbits where fed, and they fed the Iberian lynx and the golden eagle on their part. La Trashumancia also benefited the birds in the flat countries, such as sand grouse, hazel-hen, bittern, etc, they could breed during spring and summer without any risk that the cattle destroyed their nests. Also bears, wolves and different kinds of vultures depended on La Trashumanica to survive. During the 18th century it became popular to move the cattle by car or train and at the same time it got less popular to work as a shepherd. The flocks also got smaller. When the rights to "las cañadas" didn't get supervised, soon the trails got built upon with houses and highways. An ancient system seemed to be disappearing to many peoples consternation. The shepherds demonstrates for their rights to their ancient cattle trails, "Cañadas Reales", and to reintroduce the traditional, annual movement of cattle, "La Trashumancia". They have arrived on their ancient cattle trail, which actually passes by the center of Madrid. On the photo they are at the "Puerta de Alcalá", the trail then continues to "Puerta del Sol", the absolute center of Madrid. 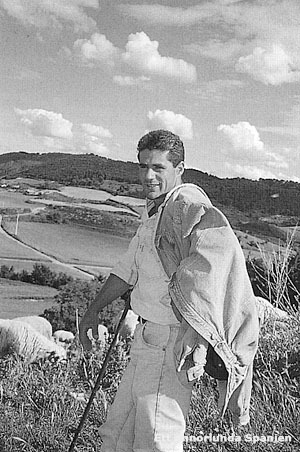 In order to reinstate La Trashumancia, to work for the preservation of las cañadas and the domestic breed of sheep, to create jobs on the countryside and to point out the countryside's social, cultural and ecological importance the "Proyecto 2001" was founded with support from among others, WWF. La Trashumancia is reinstated since 1993 and the project will continue until 2001, or as long as there are funds to support it. For those who care, one can support the project. You can finance a sheep with 10.000 pesetas or 250 square meters of pasture land with 5000 pesetas. Then you will receive the title Honorary Shepherd of the Royal Cattle Trails. Not bad! The preservation of La Trashumancia and las cañadas involves a huge potential for a growing tourist sector on the countryside, this in a country where tourism is the largest industry today. The right to use las cañadas is for everyone, in contrast to the surrounding private land.